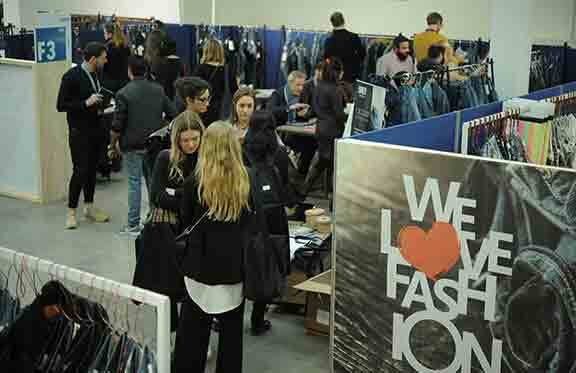 Denim Première Vision held between 5th and 6th December 2018 reported an increase in visitor numbers by 17 percent, a widely acclaimed location, the first Denim Première Vision in London, at the Old Truman Brewery, confirmed the logic behind the show’s transformation that began last May in Paris. Closely attuned to the market, Denim Première Vision now proposes a new event format in terms of experiences and contents, one exploring the different facets of contemporary denim, to address the needs of denim brands and creative fashion brands developing denim collections, from fashion and luxury brands, to pure jeanswear players, web players and more. The show is now an itinerant event, organized in alternating, different European cities with a fashion impact, to provide industry professionals an opportunity to meet new markets while discovering new sources of inspiration. This promise of a global experience attracted over the 2,344 visitors to the London edition. The visitor numbers were up by 17% as compared to November 2017, showing their enthusiasm for this show. Coming from 54 countries, more than 50 percent were from countries outside the United Kingdom, confirming the international vocation of the show. Almost 80% came from Europe, led by the United Kingdom (47% of visitors), followed by Italy (+ 69%), Spain (+29%), France (+5% of visitors), Germany (up 18%), the Netherlands (+2%) and Portugal (+22%). In second place among visiting countries, Turkey also saw a 48% increase in attendance, despite the political and economic difficulties. Finally, the U.S., which also numbered among the show’s top 10 visiting countries, nonetheless saw a decline in attendance (-25%) at the show. A selective and specialized international offer featuring developments and innovation from 89 exhibitors selected from among the most creative, high-quality, and innovative companies in the global denim industry. Exclusive and inspiring fashion approach to creating Spring Summer 20 collections, with a dedicated space - a Denim Trends Area, seminars, practical workshops. The spring summer 2020 fashion decoding in the SS 20 Denim Fashion Highlights document can be seen at website. 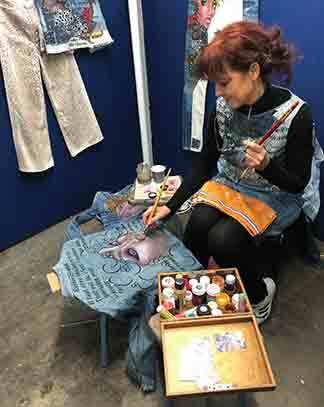 Following on the warm and positive signals sent by the London market, Denim Première Vision has announced the dates and locations of its 2019 events: Milan: Superstudio Piu, 28 and 29 May and London: at the Old Truman Brewery, 4 and 5 December 2019. 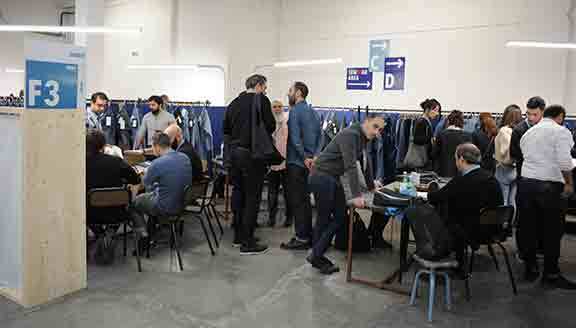 The Denim Première Vision show alights for the first time in Italy’s fashion capital next 28 and 29 May 2019, in an aim is to broaden the business outlook for its partners. The goal of the show is to touch down above all in mature markets offering denim professionals new business development opportunities. As an itinerant show, Denim Première Vision also intends to ensure a continuity between its various editions. While the show turns to new destinations to help businesses invest in new markets, the challenge also lies in building ongoing relationships between these various players. At Denim Première Vision, NDL (Navena Denim Limited) presented new Horizons of Soft Stretch FREEF!T® with patented LYCRA® Free-fit® Technology. The patented LYCRA® dual FX® YARNS delivers easy stretch fabrics that hold their shape with lower compression pressure, thus offering more comfort than standard stretch fabrics. 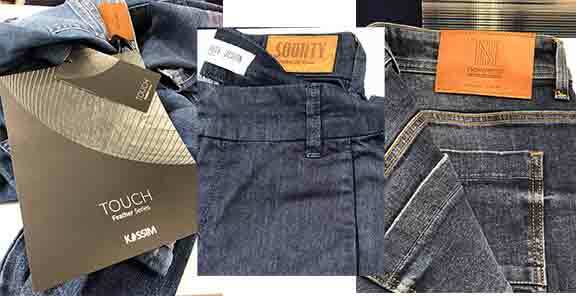 Soorty Enterprises Ltd. is one of Pakistan’s leading denim manufacturers. Soorty’s Cradle to Cradle GOLD CertifiedTM line offers a wide selection of fabrics ranging from light to heavy weight in both stretch and non-stretch constructions. All the raw materials and processes used in the manufacturing of C2C GOLD range are sustainable and certified. Collections by Kassim denim, Soorty and Naveena. Rajby was founded in 1972 in Pakistan and is now producing 3.2 million meters of denim fabric and 1.5 million garments each month. The company has installed effluent treatment plants (ETPs) to minimize soil and water contamination. They conduct regular energy audits at their washing factory, to take all possible measures for energy conservation. Rajby partnered with UNDP and trained hundreds of workers on skill development and capacity building programs to ensure their contribution in social development. To ensure effective use of resources, they have engaged WWF-Pakistan to improve resource efficiency through various energy improvement programs. They are using modern tools of sustainability to gauge their performance through international platforms known as HIGG index - Sustainable Apparel Coalition (SAC) and Business Environmental Performance Initiatives (BEPI). They are also a member of BCI. Founded in 1999, Prosperity Textile is a large-scale vertically-integrated denim fabric manufacturer, with production facilities in China and Vietnam. They are members of LYCRA EXCHANGE, BO, COTTON LEADS and SAC (Sustainable Apparel Coalition). Prosperity uses a wide range of sustainably sourced materials ranging from cotton to TENCEL® lyocell though Repreve®, Sorona® and Coffee Charcoal. More than 20% of fabric sales are from sustainable collections. In terms of production, they apply more eco-friendly indigo dyeing technologies, lower water and chemical consumption with lower COD values. Founded in 1953, ORTA transformed from a spinning and weaving company to a denim manufacturer in 1985. ORTA started its sustainability journey at the beginning of 2000 by using organic cotton. Their sustainability platform Orta Blu was founded in 2010 and they have been an early supporter and adopter of BCI. ORTA is making a bold commitment to be a leader in transforming the denim industry with the most advanced natural technologies. Every fabric is being made using the INDIGO FLOW process, that is proprietary to ORTA. The INDIGO FLOW is a CLEAN LABEL PROCESS where it is possible to achieve upto 70% reduction in water use, better dye penetration, energy saving with a richer and cleaner look. Transparency, commitment and trustworthiness are key elements of ORTA’s philosophy and the main goal is making 100% transparent production not only in the supply chain but in all stages of the life cycle. As of AW10/20 collection, they labelled each and every ORTA garment with a unique QR Code that provides full transparency in the making of the fabric so that you can finally monitor and measure the environmental impact. Lastly, ORTA has also acquired the 3rd party Environmental Product Declaration (EPD) for four products. Established in 1987, Advance Denim is one of the leading Denim mills in China, which is part of several industry initiatives, such as Cotton LEADS by an alliance of industry organizations in Australia and the United States of America and Sustainable Apparel Coalition (SAC). Advance Denim reports that since 2013, the energy consumption has been reduced by 31% per yard of production since 2013 and 7.8% reduction in average from 2013 to 2017. Furthermore, water consumption was reduced by 34% from 2013 to 2017. The applications of energy-efficient machine replacements and equipment upgrades have significantly reduced energy consumption and reduced their carbon footprint. Furthermore, for cleaner energy and steam, they use good quality anthracite, which produces no smoke or soot residue. The low Sulphur and volatile content in anthracite make it a clean-burning fuel. They cooperate with international suppliers, universities and standard organizations to develop and set guidelines for chemical use. They operate their own Restricted Substance lists (RSL) that is monitored and enforced through a rigorous system of testing and verification. All suppliers must comply with the list's requirements. They provide quality assurance team with hazardous training which is conducted by professionals. They are also trained on Oeko-Tex compliant chemicals. DENISOL® PURE INDIGO 30 liq has been officially launched by Archroma last month and Advance Denim was the first mill to do the test. Archroma's new aniline-free indigo dye, Denison® Pure Indigo 30 liq, reduces risk when producing the traditional, iconic indigo blue that consumers associate with denim and jeans. A technology applied in order to have low indigo penetration on the yarn which will be easy to laser and easy to wash reducing the energy and water consumption during the laundry processes. Eileen Fisher is an American clothing designer and founder of the women's clothing brand Eileen Fisher, Inc.
Fisher's designs are characterized by simplicity, and Renew is more than a take-back and reuse program. It's part of Eileen Fisher vision for a future without waste and their commitment to being circular by design. Here's how it works: For example one can bring back their old Eileen Fisher clothes and they find them another home or turn them into one-of-a-kind designs. When the clothes can no longer be work, they remake them into one-of-a-kind designs and they save scraps because they're tomorrow's raw materials. Since 2009, the company has taken back 1,000,000 pieces of clothing. 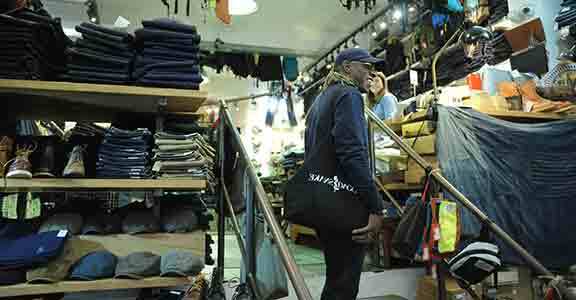 Every day, their recycling centres receive roughly 800 items of Eileen Fisher clothing. The team checks the quality and condition of each piece, and then gives it a good as new cleaning. Clothes that are still in perfect condition are resold and given a second life. A portion of sales go to programs that support positive change for women, girls and the environment. Roughly 25% of the clothes they take back are damaged beyond repair. Resewing allows the creation of beauty from waste. They deconstruct Eileen Fisher clothes and cut away any worn or damaged parts. Next, they stitch the remaining fabric together to create a unique design that is cut and sewn at their Tiny Factory in New York. Each limited-edition Resewn piece is cut and sewn from old clothes and is entirely one of a kind. THE RESEWN DENIM JUMPSUIT: The resewn denim Jumpsuit on display was made with 5 pairs of jeans to make one jumpsuit. They created a technique called "engineered pattern" which utilizes existing Eileen Fisher patterns as a white canvas and they engineer new seams in order to fit the inventory they already have at the factory. The original pattern of this jumpsuit was a S15 sample that never made it to the line. They took the pattern and divided into 22 patterns in order to be able to use their denim jeans to execute them. The scraps from production will be utilized to create new felted textiles. They offered this jumpsuit in black and indigo with a size run of XS to Large. THE RESEWN DENIM KIMONO: This Kimono takes 5.5 pairs of jeans to make this kimono. They also utilized the “engineered pattern” technique. They used the most basic shape Eileen Fisher has on the line and the true inspiration from her company “The Kimono” and divided it into 18 patterns to be able to use their denim jeans inventory. They offer this kimono in Indigo. light grey and dark grey with a size run of XS-L. 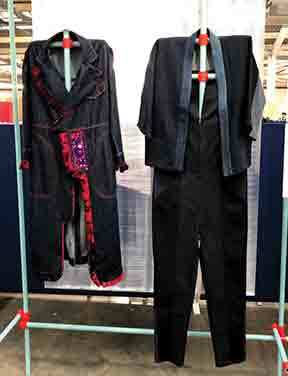 The Resewn Denim Kimono and Denim Jumpsuit made from old Eileen Fisher clothes. Berto Industria Tessile was founded in 1887 in Bovolenta, a small town in the province of Padova, Italy. Over the years, Berto has distinguished itself in many fields while maintaining its production in the place where it was founded in 1887. Innovation, originality and speed have distinguished the way-of-work of a more than century-long production. Concerning the environment, they pay great attention to energy recovery, to constant research of ecological materials, natural processes and water recovery. CIRCULAR DENIM: 100% Regenerated Cotton. In order to become more and more circular, Berto worked with a supplier that is spinning for them a yarn composed of recycled materials made exclusively for their own denim fabric production. Thanks to the regenerated cotton yarn, 65% of the standard usage in terms of water consumption is saved. Furthermore, during the indigo dyeing process, a natural and totally biodegradable sizing is used and lastly, a new particular finishing process permits saving of 85% of the water as well as 32% of CO2 emissions per meter of fabric, as compared to a standard finishing process. BIO ECO DENIM: 98% Cotton, 2% Elastane. The INDIGO DYE used for these organic cotton fabrics is NATURAL and stems from the processing of the leaves of the plant Indigofera Tinctoria, which is cultivated in South India. The cultivation of these plants occurs in the total exclusion of harmful chemicals. The indigo dye is extracted from the leaves through a process of bio-fermentation in water. The waste material resulting from this process is used as fertilizer for the soil itself. These fabrics are GOTS certified and the substances used in the production process are also approved by REACH. As a part of commitment to circular economy, Artistic Milliners work with I:CO and brand partners to re-use post consumer waste. Artistic Milliners has its own set-up to recycle and remake the denim garments. In 2016, 1.4 million jeans were produced from post consumer waste. With this quantity, the water savings added up to 13.6 million liters. Kilim Denim manufactures lovely denim fabrics within the Re-create collection. The Alliance for Responsible Denim presented Kilim Denim collection, with organic cotton and cotton yarns recycled from used denim products with Global Recycled Standard (GRS) certificate. The denim fabrics made by Kilim are without chemical finishes, and the brand does not harm health or nature with its raw material while making no compromise on the performance of the fabrics. 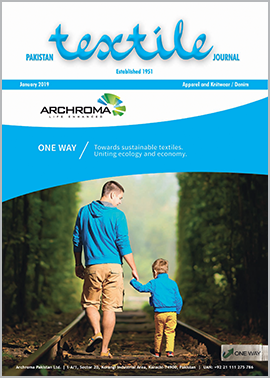 Artistic Fabric Mills and Garment Industries is the first denim mill in Pakistan to receive the Global Recycle Standard (GRS) certification for its Post-Consumer Waste (PCW) Recycling Plant. Artistic Fabric Mills and Garment Industries considers post-consumer recycled denim as a cornerstone that supports a holistic approach to sustainability in all areas of production, starting from fibre, fabrics (dyeing, finishing), garments (energy, chemicals, resource savings). Era Garment has been dedicated to sustainability in 2013 by using organic and recycled cotton fabrics. Over the years Era has worked with several mills that offer post consumer recycled denim collections. Era’s latest project is the construction of a ‘Sustainable Washing Plant’ to be completed end of 2019. This Green Factory will allow ERA to use even less water, chemicals and energy. The future of denim is circular and the post-consumer recycled denim is a fabric made with less than 5% of recycled fibres obtained from used garments. Adopting post-consumer recycled denim will allow the industry to reduce our dependency on natural resources like raw cotton and decrease the volume of textile waste ending up in landfills. Additional savings in water means creating 20% recycle denim saves up to 1500 liters of water per jeans. contribution in compiling the PV Denim exhibitor highlights.